Rupert Parker takes a culinary tour of Andermatt and discovers military uniforms and Swiss Army Knives have been decommissioned in favour of chef’s whites and kitchen knives. Located at the crossroads of Switzerland, and the town closest to the St. Gotthard Pass, Andermatt was once a thriving spa resort. The building of the railway tunnel, connecting the country to Italy, and occupation by the Swiss army, spelt the end of tourism. These days, the soldiers are almost gone and the town is developing into a high profile ski resort with quality accommodation. The food has improved too, no longer limited to army rations, with influences from the rest of Switzerland and the north of Italy. It also promises some surprises. The Chedi, the town’s most luxurious hotel, has a range of dining options. I take the romantic route, with a horse-drawn sleigh ride across the frozen golf course to the Chedi Clubhouse. It’s too early in the season for serious putters but they’re still serving dinner. A plate of locally cured meats and pickles is a good introduction to the charcuterie of the region. 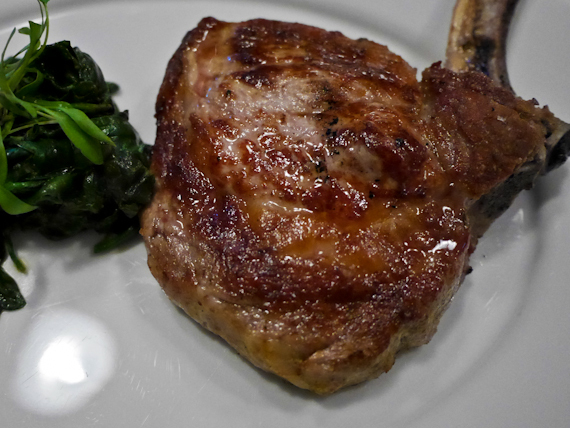 That’s followed by a juicy chunk of veal chop served with spinach, sage butter and noodles. 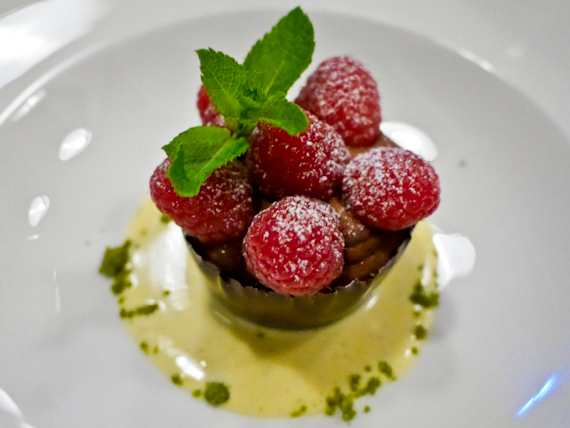 Dessert is chocolate mousse topped with raspberries and service is impeccable. In the morning I go to Intschi, lower down the valley, and take the cable car up to Arnisee, one of the region’s most attractive mountain lakes, at almost 1400m. 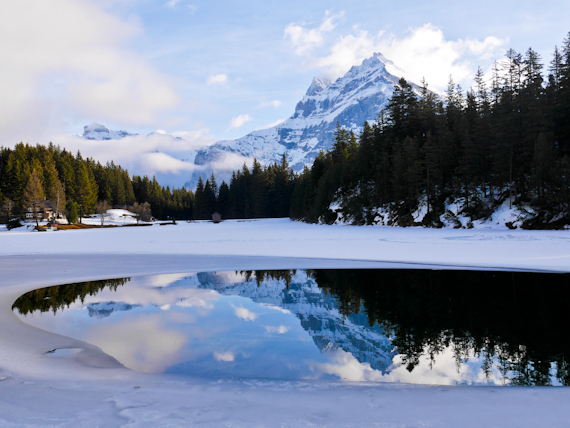 I’ll be staying at the Alpenblick, a simple alpine guesthouse and the idea is to explore the lake on snow shoes. Unfortunately the weather has turned to rain and thick cloud hugs the shores, making visibility zero. Instead I retreat to the kitchen and get some cooking lessons with Chef Silvio Thurig. 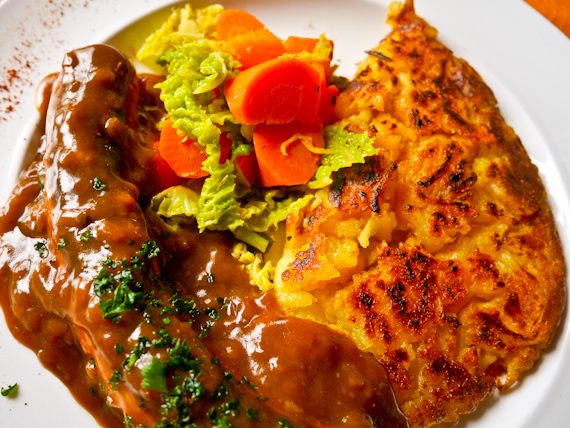 I’ve often wondered how to make Rosti, the ubiquitous Swiss delicacy and learn that the trick is to boil the potatoes first until they’re soft. You leave them in the fridge for 24 hours, then grate them. You fry the mixture with butter, shaping it into a thin cake, making sure it doesn’t stick. After ten minutes you toss it, adding more butter so it can brown on the other side. 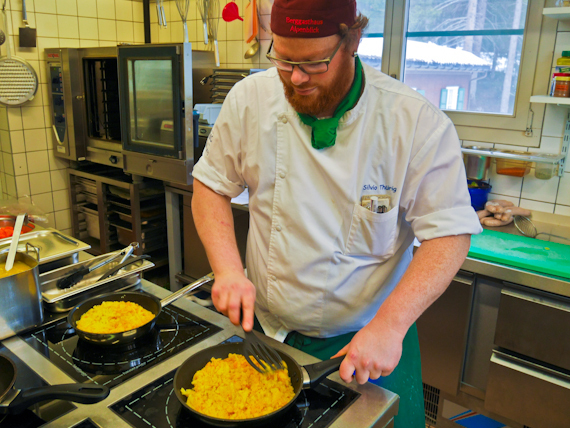 Silvio fries up some local sausages and adds vegetables to complete a dish designed to satisfy the hungriest alpinist. Now a story about mountain food wouldn’t be complete without Fondue. Under expert direction, I pour a large amount of white wine into a pan, add grated cheese, half emmental and half gruyère, throw in a couple of peeled garlic cloves and start to melt the cheese. 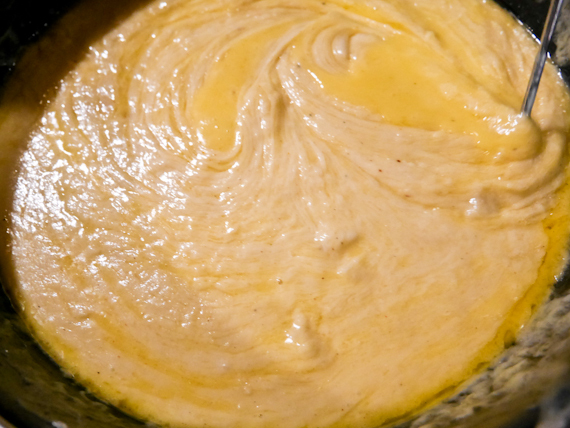 It’s essential to keep the heat low enough to avoid burning, and also stir continuously until the mixture is bubbling with a silky consistency. Finally, I add a dash of Kirsch, before delivering it to the table, with chunks of day old white bread. I remind the diners that if they lose a piece of bread, during dunking, there’s a forfeit to be paid. Next day the weather’s brightened substantially so I get the chance to walk round the lake without needing snow shoes. Back in Andermatt, famished after my exertions, I hear there’s something unusual on the menu. The Bären Restaurant is on the main street, not far from the Aurora petrol station which featured in the James Bond film “Goldfinger”. Food here is Italian and the waiter is like one of those comedy caricatures. He gesticulates excitedly, in broken English, that I’m going to be eating Marmot, a type of large mountain squirrel. It’s definitely a first for me. Apparently there’s a glut in this part of the Alps so there’s a season when it’s legal to trap them. I’ve already seen Marmot grease in the Andermatt shops, advertised as being good for aching joints, but I’m not too sure about the medicinal properties of the flesh. 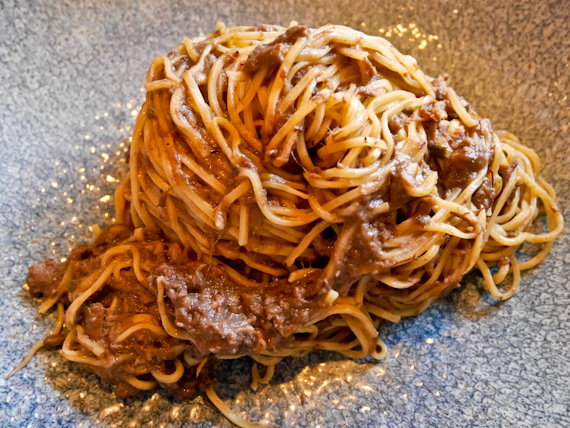 I wonder whether I’ll get Marmot on toast, but instead it’s slow cooked, ragout style, and served with Taglierini pasta. Now, in a blind tasting, I’d probably guess it was veal rather than squirrel, but I’m not complaining. In the evening I take a short train ride to Nätschen for a winter barbecue, slightly intimidating as the temperature has ducked below zero. 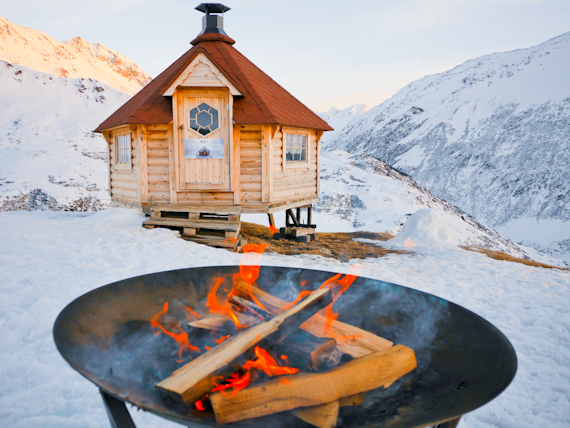 Outside the station I see a warming fire outside a curious tiny hut, known as a Scandinavian Grill Cottage. 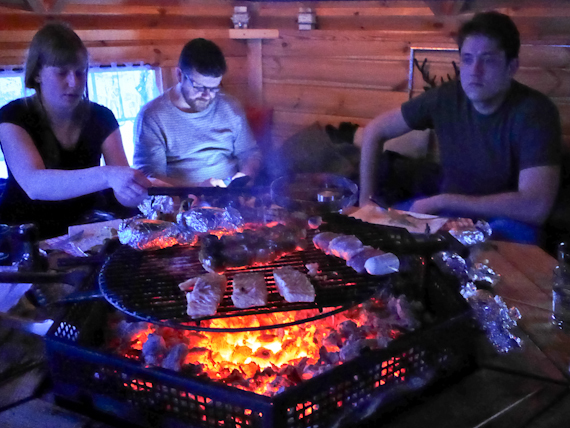 Inside it’s warm and cosy and everyone sits in a circle around the glowing coals of the central grill. It’s DIY here and there’s a hamper filled with chicken, salmon, sausage and vegetable kebabs, with some precooked baked potatoes wrapped in foil. Now normally you’d be supplied with a selection of beer and wines but I’m told not to drink alcohol as transport back to town is by toboggan. It’s sound advice since I’m soon hurtling down the hillside on my sledge, attempting to negotiate the switchbacks, lit only by a head torch. It’s perilous stuff but I survive a couple of spills with no damage, or so I think. I wake next morning, bruised all over – finally I understand why there’s a demand for Marmot fat in these parts. The Grill Experience costs around £60 pp for parties of 6-10, including food and drinks, bookable at the tourist office. 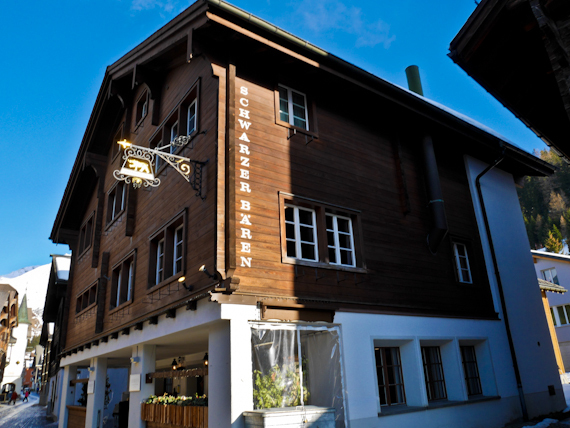 Hotel Schlüssel makes a comfortable base in Andermatt and prices start at around £90. 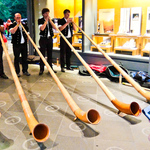 SWISS operates offers up to 119 weekly flights from London City, Heathrow, Gatwick (seasonal), Manchester, Birmingham, Edinburgh (seasonal) and Dublin to Zurich. All-inclusive fares start from £67 one-way, including all airport taxes, one piece hold luggage and hand luggage, plus meal and drink. SWISS are also happy to transport your first set of ski or snowboard equipment and boots free of charge in addition to your standard free baggage allowance. 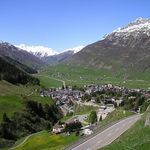 Andermatt has information about the town.